Not many people are satisfied with the leaders we have in the public and private sectors. We are suffering from a severe lack of good leadership—even though billions of dollars per year are spent on leadership training and development. The root cause of this leadership vacuum is that leadership gurus firmly believe, teach, and preach that anyone can be “made” into a leader with the right training, personal desire, and commitment. With this premise, they’ve approached leadership as a commonplace and elementary skill that anyone can learn. There’s just one problem: they’re wrong. how to deal with poor leaders who hurt you and your organization. Leadership DNA examines the false premise that anyone can be a leader and provides insights and tools that lead to a better system of identifying, selecting, and developing born leaders. 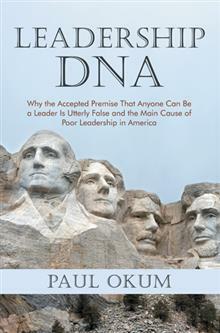 Paul Okum earned a bachelor’s degree from Temple University in business administration. He worked forty years, spending time in the military as a US Army officer and in leadership positions with the federal government in the Departments of Transportation, Interior, and the Army, as well as serving as a human-resources director in the Defense Department. He is retired and lives in Florida.